Announcement I create heirloom quality handwoven textiles using luxurious, ecofriendly fibers, and split my studio time between a studio in a renovated mill building in Lowell, Mass. and the beautiful Shaker Historic District that I'm lucky enough to call home. Whenever possible, I source local, organic and/or sustainably grown fibers to use in my work, and my looms are completely person-powered (by me!). I am happy to work on custom items based on my current designs and do engage in wholesale arrangements. Just contact me and we'll chat about what you'd like me to create for you. I create heirloom quality handwoven textiles using luxurious, ecofriendly fibers, and split my studio time between a studio in a renovated mill building in Lowell, Mass. and the beautiful Shaker Historic District that I'm lucky enough to call home. Whenever possible, I source local, organic and/or sustainably grown fibers to use in my work, and my looms are completely person-powered (by me!). Beautiful towels and extremely high craftsmanship. A work of art. Thank you! 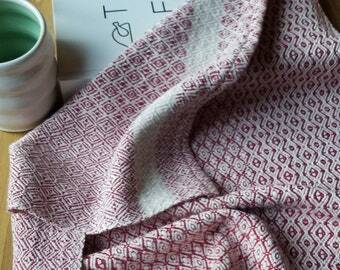 So many household uses for this delightful textile. Beautifully made! Love the dense weave and the sunny stripes. Clearly made by hand with a bountiful heart....I am delighted to have found this truly beautiful scarf that is superbly woven. It is a treasure and an instant heirloom. It will always be affectionately considered my "snowflake" scarf based on the yarn and the weave structure. Kristin is genuine and very personable. 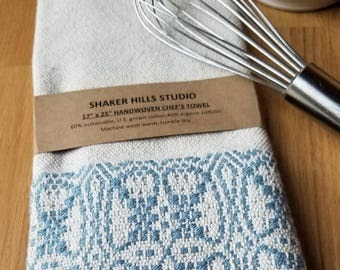 Shaker Hills Studio is an exceptional shop! Weaving a scarf with naturally colored yarn made up of a cashmere/alpaca/silk blend. Warping my little Harrisville loom with silk - with a Matchbox car from my son to keep me company. The neighbors. Dolly the Llama looking out for her sheep in front of an old Shaker barn. I've been weaving for 17 years (time flies!) 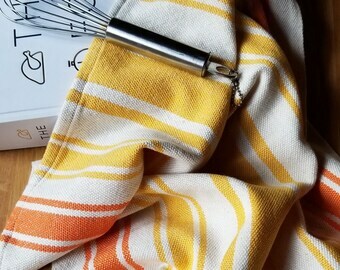 - I purchased my first loom from Harrisville Designs in New Hampshire as a kit, built it over a rare weekend off from my former job as an attorney, wove some really horrible dish towels as my first project, and haven't looked back since. 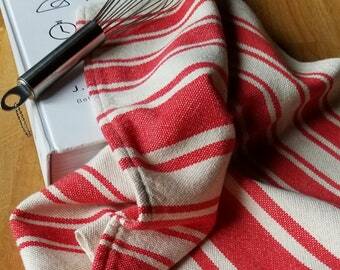 My work has improved considerably since I made those first dish towels. And since starting to sell my work in 2006, I've sold hundreds of items through local juried craft shows, galleries around New England, the deCordova Museum Shop, Open Studios at my studio building, and, thanks to Etsy, have shipped my work across the USA and the globe. I'm also active in my local weaving guilds, teach workshops related to weaving at various guilds around New England, and am a member of the Handweavers' Guild of America and Complex Weavers. And my work has been published in Handwoven Magazine. About seven years ago we moved to Harvard, Massachusetts, and in to the midst of the second-oldest Shaker settlement in the United States. The Shaker houses are private homes now, but the scenery and architecture that I am surrounded by still take my breath away on a daily basis. I try to use that beauty to inspire my work - clean lines, interesting color combinations, and timeless design are hallmarks of my weaving. I am single-maker artisan, so I design, weave and finish all of my work myself, either in my home studio or at Western Avenue Studios in Lowell. I've been weaving for over 16 years - weaving is an exacting art, and is only perfected after many years. Thanks so much for stopping by my Etsy shop! I specialize in heirloom quality, limited edition and one-of-a-kind handwoven home goods and personal accessories made from luxurious, ecofriendly fibers that are a joy to touch and to wear. I weave each piece on one of my completely human-powered floor looms. If you are dissatisfied with your purchase, I will refund the purchase price of the item, minus shipping fees, upon return receipt of the item in its original condition. Requests for returns must be made within two weeks of receipt. Click on the "Contact the Shop Owner" link on my shop homepage to contact me, and we'll work it out to your satisfaction. I accept payments through Direct Checkout (for payments by credit card, debit card, Etsy gift cards and PayPal). I ship within 1-3 business days of receiving payment via USPS. Towels ship via First Class mail for a flat fee of $2 (additional towels ship for free). 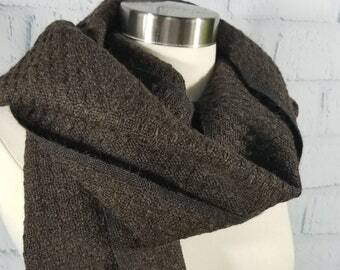 I ship scarves via Priority Mail for $6.00 to anywhere in the United States. Please contact me for International Shipping rates. Any international customs fees or duties are the responsibility of the buyer. International customs forms are marked as containing "Merchandise." Laundering and care instructions are included with each handwoven piece. I am happy to work on custom handwoven items that are based on the current items available in my shop - just click on the button on my shop home page that says "Contact Shop Owner" and we will talk about what will suit your needs. I am also happy to consider wholesale arrangements. Please contact me for further details about terms, minimum order, discounts levels, etc.